12, 30, 53, 93, 170, ? 25, 25, 31, 55, 115, ? 42, 84, 252, 1008, ? The pattern is, *2, *3, *4, *5,.. The following line graph shows the ratio of import to export of a company in 6 different years. If the import of a company in the year 2013 is 3.6 lakhs and the export of the company in the year 2015 is 2.4 lakhs, then find the ratio of export of the company in the year 2013 to that of import of the company in the year 2015? If the import of a company in the year 2012 and the export of the company in the year 2014 is same, which is equal to 4.5 lakhs, then the export of the company in the year 2012 is what percentage of import of the company in the year 2014? Find the export of the company in the year 2016, if the import of the company in the year 2016 is 6.6 lakhs? The export of the company in the year 2011 is 2.6 lakhs and the sum of the import of the company in the year 2011 and 2015 is 7.45 lakhs. Find the export of the company in the year 2015? 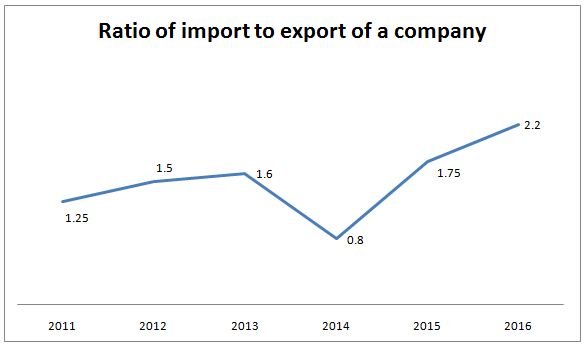 If in the year 2014, the import of the company is increased by 20 % but the export of the company is decreased by 25 %, then find the new ratio between the import to export in the year 2014? The import of the company is increased by 20 % but the export of the company is decreased by 25 %. 6) If the import of a company in the year 2013 is 3.6 lakhs and the export of the company in the year 2015 is 2.4 lakhs, then find the ratio of export of the company in the year 2013 to that of import of the company in the year 2015? 7) If the import of a company in the year 2012 and the export of the company in the year 2014 is same, which is equal to 4.5 lakhs, then the export of the company in the year 2012 is what percentage of import of the company in the year 2014? 8) Find the export of the company in the year 2016, if the import of the company in the year 2016 is 6.6 lakhs? 9) The export of the company in the year 2011 is 2.6 lakhs and the sum of the import of the company in the year 2011 and 2015 is 7.45 lakhs. Find the export of the company in the year 2015? 10) If in the year 2014, the import of the company is increased by 20 % but the export of the company is decreased by 25 %, then find the new ratio between the import to export in the year 2014?